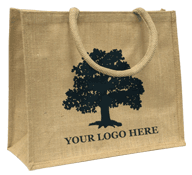 Go with the environmental flow & encourage your customers to use this great jute shopper bag again & again & again!! Not just for shopping - as this natural jute bag is strong & sturdy - it also provides an ideal packaging solution for large products & gift items. "Very good products and super value. My small first order was needed in a hurry and despite never having dealt with me before I was treated as a valued customer and the order was with me by the time I needed it"
Have searched for jute gift bags for my preserves and pickles, your company was recommended to me, now I would recommend you to anyone excellent service, products and prices.